I was raised by vegetarian parents and I was never into horses as a little girl. I have rocked cowgirl boots for years while hugging trees and advocating for Fair Trade coffee, organic farming and sustainable logging. Now, in my late twenties I have become convinced that eating meat and becoming a cowgirl will help save the world. 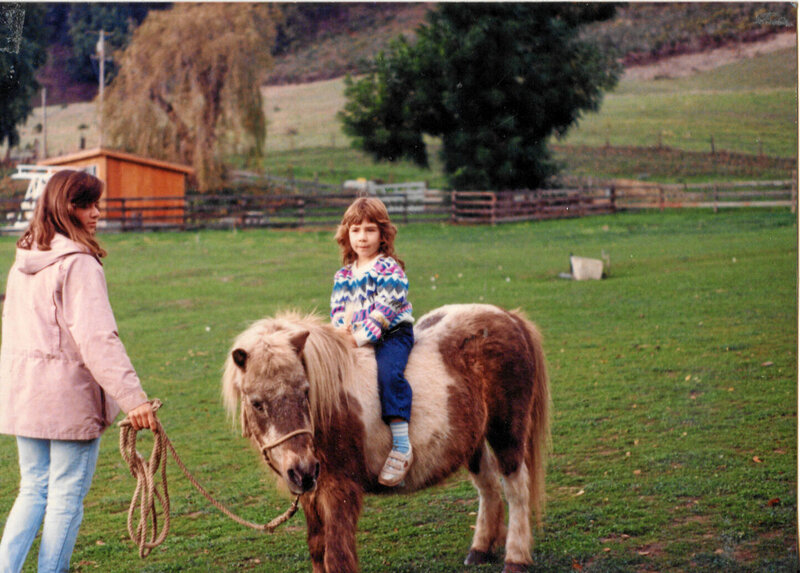 Maybe it was there from the start; don’t I look like a natural on this pony? I have been wanting to write on this topic for awhile, especially since watching this TED talk by Allan Savory: “How to fight desertification and reverse climate change.” Savory’s story of working for conservation in Africa is a bit heartbreaking, but his findings offer hope for the entire planet. I recommend watching the video, but in short, Savory’s research demonstrates how the rotational grazing of herd animals can help restore the soil’s fertility and rebuild biodiversity in the vast deserts that we have created. This is a profoundly important and optimistic perspective on climate change; the technology is simple and available and the results are miraculous. I used to think I was looking for cowboy, now I’m just looking for a horse. I decided to blog about this today after listening in on a live conversation as part of International Permaculture Day. Before I get to the meat issue, I want to say that I am a trained permaculturist and I love growing and eating plants and totally agree with Michael Pollan that we should all eat a lot more of them. And, I love my vegetarian parents a lot. I completely understand that some people are simply unwilling to kill another being for food for ethical reasons. However, I have some problems with the black and white discourse about raising and eating meat from an environmental perspective, and I think we should be looking at the issue in a more nuanced way. Today’s conversation was between Craig Sams (founder of Green and Black’s Organic Chocolate and Chair of the Soil Association) and Satish Kumar (Editor of the Resurgence & Ecologist magazine and founder and Director of Shumacher College, International Centre for Ecological Studies and The Small School). Kumar began by explaining the three fundamental principles in his approach to ecological design and permaculture: soil, soul and society. I am totally with them as they discuss the complex beauty of soil science, the need to work from the soul and the importance of coming together as a community to garden and restore the earth. Soon the conversation turns to the fact that we live in a predominantly meat eating and meat raising society. Kumar asks Sams to describe a sustainable diet from a permaculture worldview. They are both vegetarians, and they believe that reducing the amount of meat we eat as a species is critical to halting climate change. I completely agree that we must stop using 80% of the world’s arable farmland to grow corn and soybeans to feed to animals; the planet simply cannot withstand the strain from industrial agriculture. The masses need an absolute reduction in the amount of meat we consume and an increase in the amount of plant-based foods on our plates. Sams explains that, “Trees can do a lot more to help the climate than sheep, or goats or cattle.” This is true if we’re talking about the industrial livestock system, but, there are other models where animals are part of a vital ecosystem. Then he goes on to quote Bill Gates’ endorsement of pursuing meat alternatives such as soy. Referencing Bill Gates doesn’t earn him any points here, as the Gates Foundation has championed a “Green Revolution” in Africa which unconscionably follows the same course which tragically failed India. Additionally, we have learned that soy isn’t actually a health food, especially in highly processed faux meat forms. I’m way more interested in how we’re going to create localized food systems which actually work. Sams mentioned Nobel Peace Prize winner Wangari Maathai’s Green Belt Movement which has planted over 51 million trees in Kenya. She is one of my personal heroes and her advocacy is so impressive because her organization mobilized rural women to manage the land with their own hands to ensure access to water and food security in their communities. To me, this is what the permaculture perspective on sustainable food should be based upon. When discussing what we eat, I think it’s most important to consider ecologically responsible management of natural resources over any one dietary preference. This is what Savory has also found in Africa. In the great conservation debate, the people vs. nature battle was being lost until people were taught how to work with nature’s balance to rehabilitate the land so that they could farm it once again. In the case of animals, I think it’s far more important that we look at the conditions in which livestock are being raised, slaughtered and transported around the world and choose options which feed, rather than destroy, the earth. The soil is the skin of the earth and we are currently destroying topsoil at a fatal rate. Every farmer’s crop depends on the vitality of the soil, and the most efficient and sustainable way to maintain soil fertility is by integrating livestock into the farm and using their manure to build the soil. Show me an organic farmer who isn’t depending on animal poop to keep the soil rich. Nothing makes more sense than shoveling your own nitrogen right on the farm, rather than using bat guano or bonemeal harvested & processed somewhere far away and delivered by petroleum-fueled trucks. If you’re ok with eating animals, I don’t think you need to become a vegetarian to save the world. My perspective is that the best thing we can do for the planet is get deeply intimate with all of our food sources. 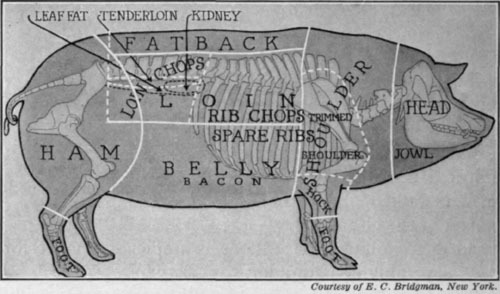 For the omnivores among us, I think the most important issue is to consider how our meat is produced, and get closer to the source. Some people advocate Meatless Mondays to challenge the obsession with meat. I completely appreciate the significance of encouraging people to go without meat one day of the week. Personally, I like to celebrate Meatball Mondays. I say, eat your meatballs, but know your meatballs. By choosing the meat we eat more carefully, we will automatically reduce our meat consumption and lessen the negative impact on the earth. In the last 4 months, Gowan and I could tell you where every single thing we ate has come from. This is probably the most impressive part of this endeavor to me. We can argue about the widespread scaleability of our approach when we look at the challenges in the modern food system, but I never said the solution would be easy. The good news is that everyone can participate in some way, starting right now. Shop at the Farmers’ Market. And say hi to Gowan on Wednesdays in Fort Bragg, and me on Fridays in Mendocino! When you are enjoying your locally sourced food, tell your family and friends where it came from and where you got it. Many people don’t even know that a local option exists. Arrange a visit a local farm. Most farms are delighted to have customers come visit, and this is by far the most fun way to know your food, and the people who produce it. If you want to eat meat, consider raising and slaughtering your own, or helping a farmer friend with their animals. I have raised chickens for meat and for eggs and it was an extremely rewarding process to be part of the cycle from raising baby chicks to putting them in the freezer. The closer we get to the food we eat, the more we value it, and the more accountable we are. Categories: Meat, Musings, Permaculture | Tags: Africa, animals, Ecologist, grazing, Green Belt, herd, international permaculture day, Kumar, meat, permaculture, rotational, Sams, trees, vegetarianism | Permalink.